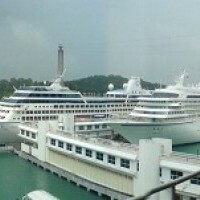 Singapore Cruise Centre Pte Ltd (SCC) is Asia’s first, and Singapore’s only award winning, cruise terminal operator. Singapore is the 9th largest cruise homeport in the world. SCC has a proven track record in managing cruise and ferry terminals in Singapore, augmented by its receipt of 21 international awards in 21 years of operations. Over the years, SCC has been recognized as having the Best Turnaround Port Operations, Best Turnaround Destination, Most Efficient Terminal Operator, Most Efficient Port Services, and as Most Responsive Port in Asia. A common user terminal, SCC is homeport to Star Cruises, as well as ships from Holland America Lines and Aida Cruises. SCC offers Cruise 360, a coordinated, cost-effective suite of services to supply and support cruise ships. Services range from beverage and marine chandlering, shore excursions, bunkering, ship repair and maintenance. Passengers travelling through SCC enjoy a suite of amenities that include food and beverage outlets, retail outlets, left luggage services, lounges and free Wi-Fi. SCC also provides consultancy services in cruise and ferry terminal management and operations as well as related tourism development to promote the growth of Asia-Pacific as a preferred cruise playground.